Could Jameis Winston possibly be the #1 overall pick of the 2015 draft? Former Florida State quarterback Jameis Winston is one of the top two quarterbacks in the 2015 NFL Draft. The Tampa Bay Buccaneers have the top pick of the draft and they really need a quarterback. The question is whether they will draft Winston or former Oregon quarterback Marcus Mariota (or another position). The Buccaneers met yesterday with Winston. You can bet they spent a lot of time with him questioning him on football and non-football matters. Winston is pretty solid on the field. He has shown a high football IQ and the ability to understand and diagram plays on a white board. He has good size and a big arm and can make all the NFL throws. Up until the National Semi-final game, Winston was undefeated on the field. 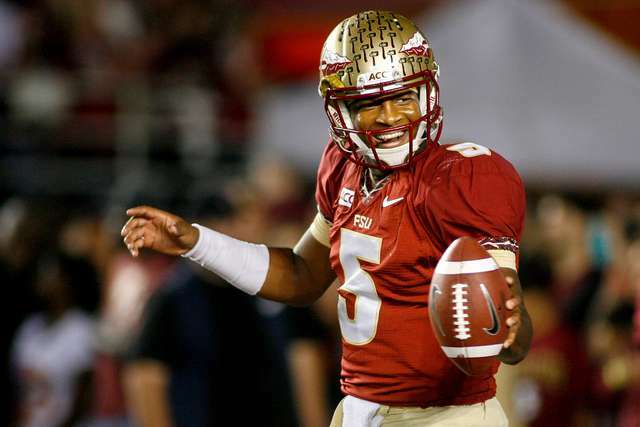 Many times this year, the Seminoles were behind and Winston willed them to a last minute win. I’m not sure there is a better college quarterback at rallying his team from behind to get the win. He is a confident leader on the field and the players seem to gravitate towards him. Winston threw for 40 touchdowns and 10 interceptions in 2013 when he won the Heisman Trophy. This year his numbers dipped to 25 touchdowns and 18 interceptions and he has taken some criticism because the interceptions. While I admit he does at times fall in love with his arm and force the ball into coverage, I believe there is another reason for the increase in interceptions. Let’s begin with the offensive line. Although the Seminoles had 5 senior starters, they lost Brian Stork to the NFL and Austin Barron took over as a first year starter. The line did not jell early and eventually Barron was lost to injury. It wasn’t until late in the year when left tackle Cameron Erving moved to center that the line really solidified. Winston was under a lot of pressure, especially from the inside pass rush and at times was running for his life. He is a pocket passer and you have to protect pocket passers, especially up the middle. The Seminoles also lost some of their weapons from 2013, including receiver Kelvin Benjamin and running backs Devonta Freeman and James Wilder. It’s true that Winston still had the school’s all-time leading receiver in Rashad Greene and Nick O’Leary at tight end, but he still had to break in freshmen at many of the receiver positions. I would like to know how many of those interceptions were on Winston forcing the ball and how many were because the young receivers ran the wrong routes. My bet is it’s about 50/50 which would take his interception total back to his 2013 numbers. I think at times Winston knew his defense wasn’t as dominant as last year and he knew he had to put the team on his shoulders and carry them. On some of those interceptions he may have been guilty of trying to do too much. The biggest question about Winston is his off the field issues. Some people refer to them as character issues, but Florida State head coach Jimbo Fisher is on record saying he believes they are maturity issues. Maturity issues are much easier to clean up than character issues. I believe there may not be a better situation in the league for Winston than in Tampa Bay. Head coach Lovie Smith would be a good mentor for the young quarterback, not just on the field, but as a man. I believe if the Bucs decide Winston is their guy, he can mature and become the face of the franchise. The Bucs already have weapons like receivers Vincent Jackson and Mike Evans, tight end Austin Seferian-Jenkins and running back Doug Martin. The addition of Winston could possibly make the Bucs a playoff contender right away. The Carolina Panthers won this division last year with a 7-9 record, so it’s not a huge stretch that the Bucs could challenge for the division crown. This entry was posted on March 4, 2015 by draftmaniacs in Draft profiles and tagged 2015 NFL draft, Jameis Winston, Jimbo Fisher, Lovie Smith, Marcus Mariota, NFL, NFL Draft, Tampa Bay Bucs.